Drawing young people to responsible participation in the life, mission, and work of the faith community. Fostering the personal and spiritual growth of each young person. This is just a very short overview of the goals of Youth Ministry. 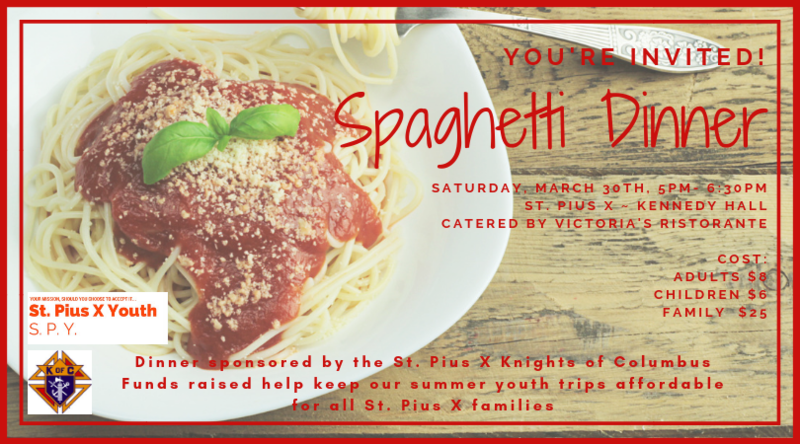 Support the St. Pius X Youth Trips this summer while eating a delicious meal from Victoria's Ristorante. Bring your whole family on March 30th for $25 or get individual tickets for $8 for adults and $6 for children. Purchase your tickets in the parish office or after Masses. Please help us plan for food by registering ahead at www.uniterochestermn.org or by clicking any of the dates listed above. 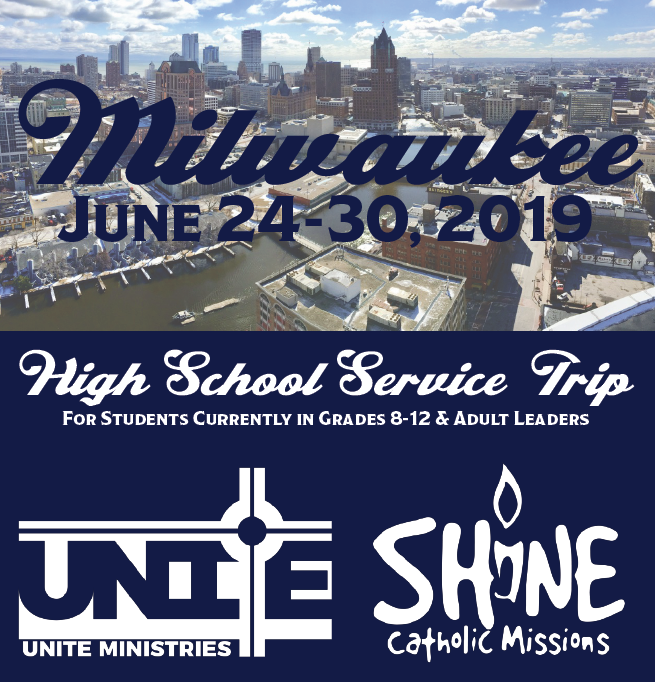 Registration is now open for our High School Mission Trip to Milwaukee, WI with Shine Catholic Missions. The High School Service Trip is an opportunity offered by local Rochester/Austin area parishes. It is open to any high school student, Catholic or otherwise, in grades 8-12 (during the school year before the summer trip). While there are many reasons parishes offer service trips, we are convinced that our main reason is because Christ has called us and has commissioned us to recognize the intrinsic dignity that resides in each and every person with whom we come in contact. The trip costs $500 ($450 if registered by February 15th, 2019). Reserve your spot by filling out this permission form and sending in your down payment of $200 ($150 if you register by February 15th, 2019). Your spot won't be confirmed until we receive your down payment. Down payments should be sent to your parish Youth Minister in cash, check or credit card. Be sure to note on envelop or in the check memo that the payment is for the High School Service Trip 2019. Download our Information Packet here. 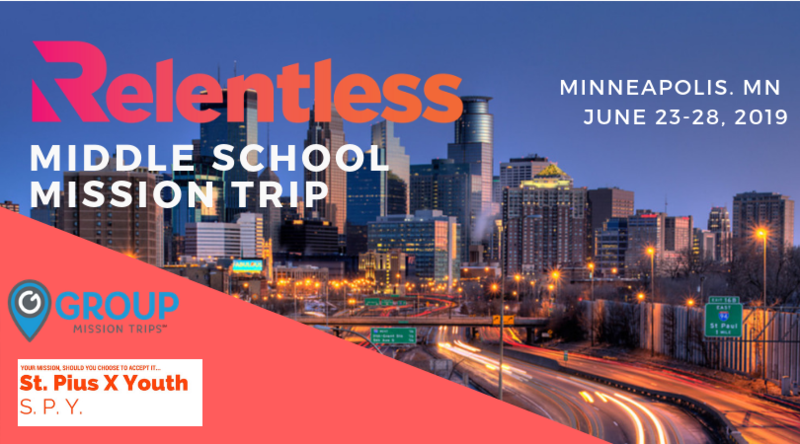 Registration is now open for our Junior High School Mission Trip to Minneapolis, MN. Our young Church feels a desire to make a difference in the world, but often doesn't know where to start. This mission trip will give our junior high students an opportunity to serve alongside teens from across the country and to dive in a little deeper to their own faith. Contact Katie Stinson to be added to our email list for interested participants or see the information packet below. The trip costs $400 ($350 if registered by February 1st, 2019). Reserve your spot by filling out this permission form and sending in your down payment of $100 ($ 50 if you register by February 1st, 2019). Your spot won't be confirmed until we receive your down payment. Down payments should be sent to your parish Youth Minister in cash, check or credit card. Be sure to note on envelop or in the check memo that the payment is for the High School Service Trip 2019. Camp Summit is a camp for students entering 6th, 7th or 8th grade who are looking to learn more about their faith alongside their peers, and in a fun and adventure-filled setting. This camp takes place at Eagle Bluff in Lanesboro, MN, in early August. There are also opportunities for high school students to participate as leaders on the Prayer or FIAT teams through an application process. Not all students who apply will be accepted so please spend some time on your application and feel free to have me look it over before you submit it. Stay tuned for more information. We will also need several chaperones for our parish – male and female. 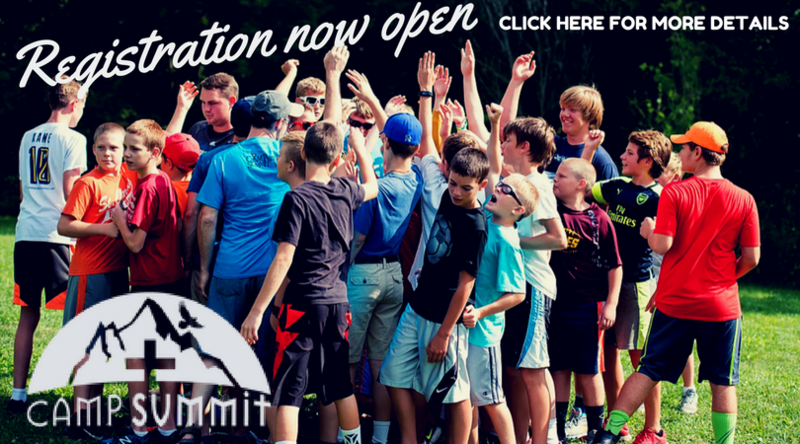 Have questions about Camp Summit? Contact Katie or click on the graphic to be redirected to the camp website. To pay deposits or make final payments click here. More Information Coming Soon. Please go to https://www.onecallinstitute.org/ or contact Matt Maus for more information! A Steubenville Youth Conference is primarily an invitation to spiritual growth. For some this means entering into a personal relationship with God for the first time. For others, this means a deeper and more mature acceptance of the gospel and the Church and a greater zeal to be a witness for Christ. The conference weekend is about developing the gifts given at Baptism and sealed at Confirmation. 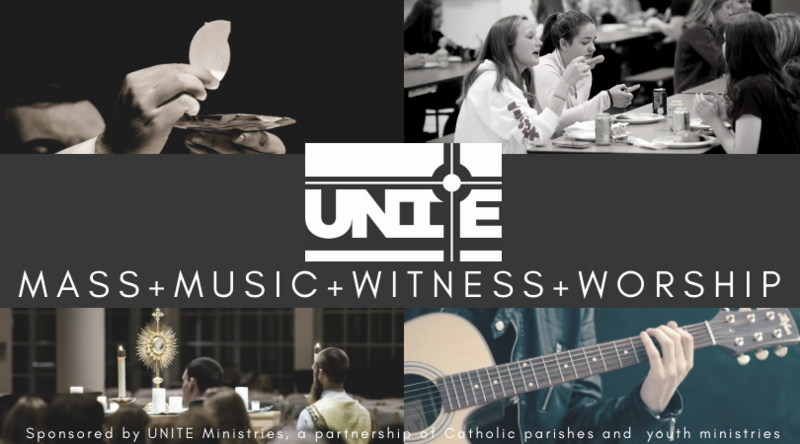 It’s about hearing dynamic speakers instruct and challenge teens in: prayer, chastity, service, and the power of the sacraments. You will discover that Christianity is not for the weak and timid; it is not a crutch; and it is not boring! It is about meeting hundreds of people on fire for the Lord: laughing, crying, talking, singing, praying, dancing and being encouraged to take a stand for Christ. Please make sure we have a medical release form on file for you or your child for the 2019-2020 year. For each event we will ask you if you need to make changes, but we will keep this on file for a year.